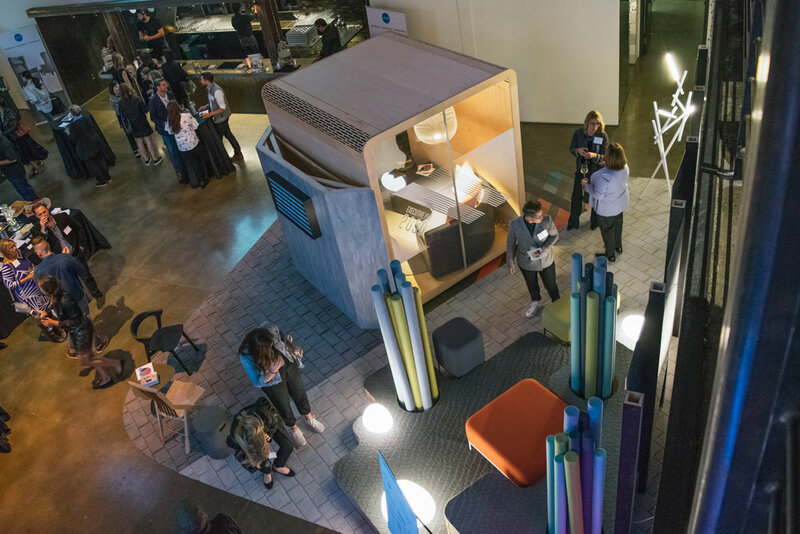 Scene Local 2018: Visions of the Future — Valerio Dewalt Train Associates, Inc.
Every year, local manufacturers, craftsmen and artists join forces to create an installation at one of San Francisco’s largest creative design events, Scene Local by IIDA Northern California. Each team is challenged to create a cohesive, attractive, and inspiring scene that incorporates products from event partners as well as assigned local partners. 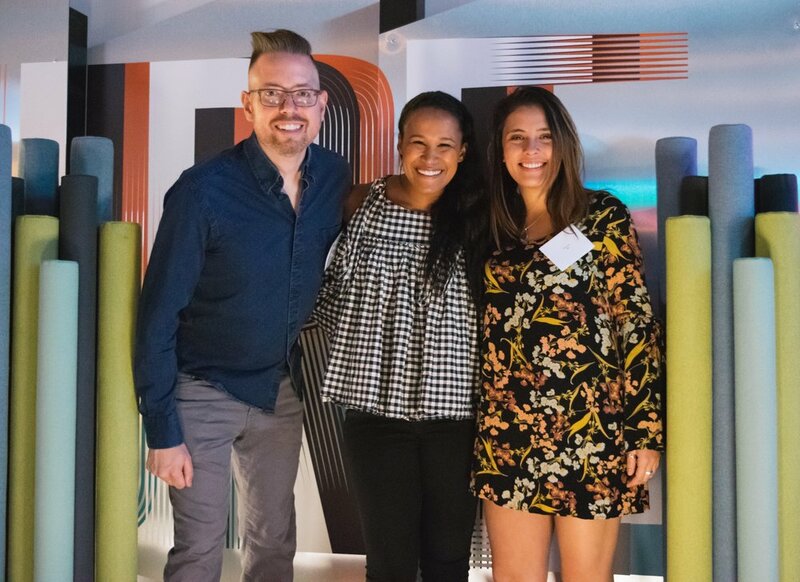 This year, our team worked alongside Media Objectives on a scene that explores the evolution of technology, demonstrating how futuristic visions from the 1950’s have evolved into reality in the 2050’s. Their evocative piece envisions a future where autonomous transportation has become the norm, but it’s not a one-size-fits-all approach. Headed to the office? Summon an on-demand executive office or eclectic meeting room. Leaving town? Enjoy a cozy living space, family activity room, or mobile yoga studio. Upon arrival at your destination the local transit hub serves as a landmark gathering place, allowing for impromptu work spaces and areas for play. Your city’s streets — free of congestion and pollution — have been adapted to serve as dynamic public spaces for exploration, innovation, and interventions of nature. What does the autonomous transportation experience of the future look like? How does the transportation center of the future function? What role does design play on the streets of a smart city? To create the scene, the team used custom graphics fabricated by Splash! to visually connect the three spaces together. 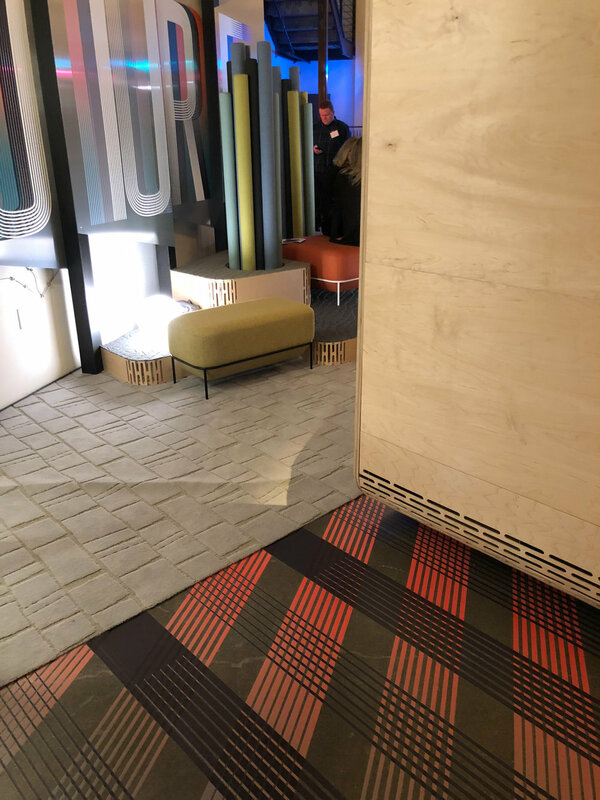 This included a colorful wall graphic on reflective dibond referencing an urban billboard along with floor graphics and window graphics to set the scene for the pod. The sophisticated plywood pod (a prototype JumpBooth by LMNOP Design) was a hit with attendees. 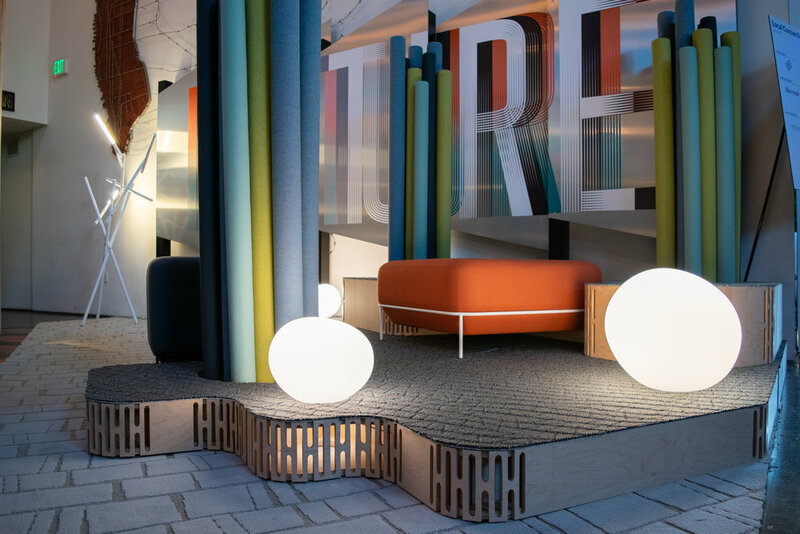 The quiet space featured a beautiful shadow-casting light by Foscarini, soft accessories from Sobu, and a custom thermoformed Corian shelf designed by the VDT team. The curvilinear shelf even included a wireless Corian Charging Surface! The playful plaza incorporated soft seating and sculptural Baudot Strings by Allermuir -- an acoustical product and fantastical tactile element in the space. Abstraction carpet by Atlas provided a graphic pattern that mimicked stone pavement and moved through the scene. On the departure platform wood chairs by Erickson Woodworking and Sobu provided a comfortable space to wait for an arriving pod. Mounted on a Corian-clad wall was Vestaboard, a split-flap display reminiscent of a retro train board but with modern internet technology. The product is still in development so a digital prototype was demonstrated, displaying quotes about the future and amusing announcements about the next arriving pod.